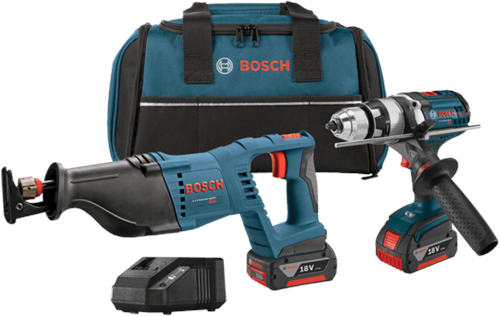 The Bosch CLPK203-181 18 V Cordless Combo Kit includes the Bosch HDH181X Brute Tough 1/2 In. Hammer Drill/Driver and the CRS180K Reciprocating Saw. The HDH181X has Active Response Technology with helps with bind-up situations. With an Open-Frame Four-Pole motor and all-metal gearbox, this drill/driver provides 750 Ft.-Lbs. of torque and 27,750 to power the toughest drilling tasks. It has a two-speed system – one for high torque (0-440 RPM) and one adjusted for high speed (0-1,850 RPM). Its side handle pivots to 23 positions. The CRS180K is a handy reciprocating saw that also brings plenty of power, with a long and efficient 1-1/8 In. stroke, for more material removal per stroke. The saw features the easy Lock-Jaw™ blade-change system, for fast one-handed blade changes. 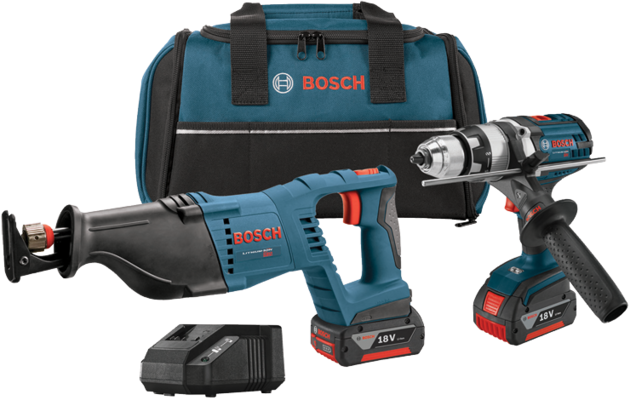 This kit includes two 18 V 4.0Ah FatPack batteries and a charger, to fully take advantage of the Bosch 18 V battery platform.